Every day more than 600 planes take-off from Heathrow. The majority head off in a westerly direction, as the westerly is the prevailing wind in London. Until the planes reach 4,000ft there are specific tightly controlled routes in which they can use. Could this be one of the 777s with the Rolls Royce engines that have been falling out of the sky due to a fault in de-icing equipment that stops fuel getting to the engines. British Airways has 15 of these in it's fleet of 44 777s - so 29 with a different engine and without the fault. However, they have said they cannot tell passengers if they will be flying on the planes with the fault or not for "logistical" reasons!!! A consideration when buying a property in these areas. As always visit other skywatchers around the world. Thank you for your comment on my site! I have to tell you, that most days during October - February are grey in my country! Even the sky is clear the sun is so low and near the horizon, that it can be seen only few minutes. We live on Northern latitudes. and I know, how few sunny days we got there, but Finland is not much better!! Nice sunny day to you! Nice shot! With the shape of the nose though and the length of the plane, it actually looks more like and A380. 777s are very long and sleek. Ooh, it is an A380! Look at the double engines! Very lucky catch! and scary bit of info about engines falling off!! Great shot although you've give me something to worry about! Oh well, there's a little danger in everything fun. I love the color contrasts of the white roof lines with that gorgeous blue sky. You take the most beautiful shots. I really look forward to seeing them everyday!!! Love the timing of this shot. Dear Mo, just made the connection that you've been the one commenting on my blog! (A little slow i guess!) I am so flattered! I love your blog and I love the amazing pictures you take, they make me want to visit England even more! Thank you so much for giving my little blog a look and for your kind words and advice! That is a beautiful capture and I'm for once glad I've got mute on the laptop. The noise there must be incredible. I'm glad I hardly ever need to fly! 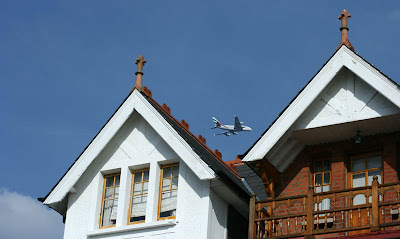 It's a shame those nice houses are under several flight paths. I awoke here in Australia to your comment on my blog post about the bushfires - thanks for that! When I saw this post on your blog it reminded me of the 3 years I lived in St Albans just north of London. The hilltop High Street of that Roman city is the perfect vantage point to see the flightpaths for Luton, Stansted and Heathrow airports. These days I am in London a few times a year on business. I think that, despite living there for several years, I didn't really "see" the city, and certainly never from the perspective of your "fresh eyes" - which I think is a brilliant title for your blog. So I'm writing back to say how much I appreciate your talented eye and look forward to enjoying more of what it sees. Not easy to get a plane on a picture like this. At least, I have tried a few times ... and failed! Bravo! Well, it's not a 777, they have only two engines. It certainly looks like an A 380! You must have been very lucky; there are so few around for the moment! The faulty engines shouldn´t be a problem here as the airplane is a miniature and it has to fly only from one house to the next one. How hard could that really be? Eek. So will they be fixed any time soon? Hope you haven't made any travel plans! This brings a whole new meaning to Sky Watch! Gulp!